On the eve of the Macworld Expo I speculated that Steve Jobs might announce a 3G iPhone during his keynote but it was not to be. However today Apple announced that it would be releasing a 16 GB version of the iPhone, as well as a 32 GB iPod touch. Both will cost $499. I’m sure that this will please consumers with large media libraries or those that prefer lossless playback. Existing owners of these devices will be looking forward to the SDK, which is due for release this month. It’s going to be really interesting what third-party developers will come up with, especially considering the incredible variety of iPhone applications that have been developed without Apple’s support. Apple has released firmware update 1.1.2 for the iPhone and iPod touch. This has inter alia added support for international keyboard layouts and – in the case of the touch – the ability to add and update events in the calendar. The latter feature addresses the touch’s most glaring weakness from a software point of view. I’ve had a chance to use the touch for a week now and have been really impressed. For my money the best feature isn’t the music player, it’s the Safari Internet browser. I’ve always been lukewarm about the desktop version of Safari, preferring Firefox’s greater flexibility, but it works great on the touch. A nice feature is that when using your finger to scroll up or down in a web page there is a “bouncing” effect when you reach the limit of the page. It’s an effective way of showing that you can’t go any further – like hitting a wall in real life, only without the pain. A small touch but one that nicely showcases Apple’s legendary attention to detail. My only real complaint is that it is too easy to accidentally activate links, which I mentioned in my last post. (That and the fact that it would be nice to have a larger viewing area – is there an Tablet Mac in the works?) It makes me wish that it the touch was not reliant on Wi-Fi so that I could use it all the time. When oh when will Apple release the iPhone in South Africa? 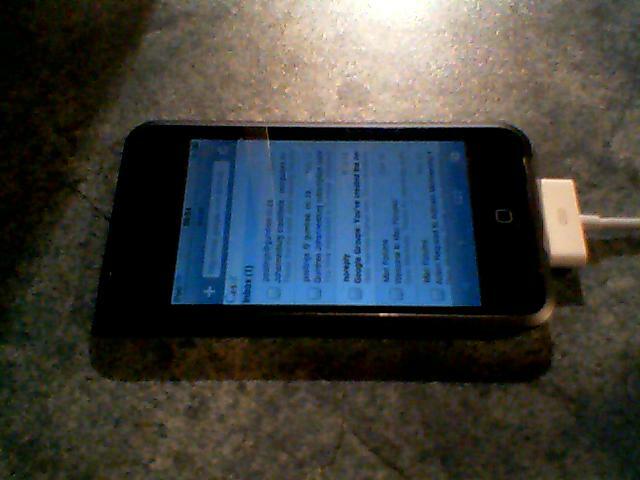 Yesterday my mother returned from a two week trip to the UK and brought back an iPod touch for me. The touch is essentially of course an iPhone without the calling and emailing features although it is possible to use web mail via the touch’s Internet browser (providing you have wi-fi access). But I am jumping ahead of myself as I mean to recount my experience with the touch from the beginning. First of all the supporting documentation is sparse to say the least, just a warranty and a very short quick start guide. The lack of documentation isn’t really an issue though, as the touch is really easy to use. Also there is no iTunes install disk so be prepared for a long wait if you don’t have version 7.4 loaded on your computer or a fast Internet connection; you have to use this version to set up the touch before you can start using it. The touch’s stripped-down Safari web browser provides a convenient way of surfing the Internet when you don’t feel like lugging your laptop around. Unlike the iPhone though the touch is not EDGE-enabled so you will need a wi-fi connection. It’s easy to zoom up web pages by “pinching” and “unpinching” the surface of the screen with thumb and fingers. However I found that occasionally my digits would inadvertently activate a hyperlink when trying to zoom in – it would be nice if there was a “Deactivate Links” feature. Also the browser doesn’t support Flash, although this is probably as much a blessing as a curse. Otherwise the touch delivers a surprisingly good web browsing experience given the limited dimensions of the screen. You can even use it for blogging and posting using the onscreen contextual keyboard. A caveat here though: it is easy to select incorrect characters on the keyboard due to the lack of tactile feedback. I didn’t delve too much into the YouTube application due to my limited Internet bandwidth but video looked crisp and sharp. The weakest application on the touch is the calendar, which is completely passive due to the lack of an event-creation feature. Hopefully this will be rectified in a future firmware update. Contacts on the other hand is one of the strongest applications and for my money is more user-friendly than Address Book in Mac OSX. It’s going to be a lot easier to access my contacts’ information once I have loaded them onto the touch. The Clock includes world times, alarms, a stopwatch and a timer. Curiously though the time and date is set via Settings. (In fact, all settings are adjusted here rather than in the applications themselves.) Also the touch’s external speaker isn’t all that loud, which hampers the effectiveness of the alarm. The Calculator has limited features but is very effective for the basic maths functions. When Steve Jobs demonstrated the iPhone at January’s Macworld in San Francisco I believe he called it “the best iPod ever” and he wasn’t wrong, at least until the touch came along. The iPhone and touch may not have the huge capacities of the Classic iPods but they present a massive step forward in terms of the user interface. To be honest I haven’t had a chance to listen to a lot of music on the touch yet but the sound quality is at least on a par with our nano. As mentioned the touch’s hi-res screen is great for viewing photos. The Photo Library has a refreshingly simple look, with pics closely arranged in a grid. Individual photos are selected by a tap and can be zoomed up by spreading your thumb and finger apart over the screen’s surface. There is also a slideshow option. And that in a nutshell is the iPod touch. It has a few minor flaws but these are far outweighed by the positives. I am looking forward to the promised software developers’ kit that should be available for the iPhone and the touch in the early part of next year. This will give developers the tools to produce some really exciting applications for these devices.